Summer has finally graced Azeroth with its presence and with this season comes a new wild pet, the Qiraji Guardling! This pet can spawn around the gates of Ahn'Qiraj, all the way up to each instance portal in southern Silithus. 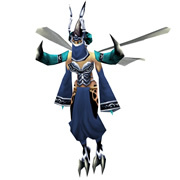 The Qiraji Guardling will be the primary pet in battle, so be careful when attempting to capture it. When in doubt, use the Terrible Turnip's ability, Weakening Blow, to ensure you don't accidentally kill your prize. For those seeking the "Zookeeper" title, the wait is finally over! Capturing this pet will complete one of the requirements for Kalimdor Safari, which in turn is part of the meta-achievement World Safari. Head over to Silithus to capture your very own Qiraji Guardling today! This pet will only last for the duration of summer, so don't delay in finding one of your very own.